Actually How Many People Lease Their Cars? We always hear the idea of leasing cars, or maybe you are already leasing a car at this moment. There are also debates whether leasing or purchasing saves you more money. There is no absolute answer for this question because the final cost depends heavily on your income/expense/tax situations, therefore it is case by case. In US, since you do not own the title of the leased car (the leasing company that owns the tile), this is classified as an operating lease. Conversely, if you are purchasing the car and finances through a financial institute, which means you assumes all the risk of owning the car and will get the title (after you payoff the loan), this makes your purchase to be a capital lease. For operating lease, you cannot capitalize the car as an asset, all of the monthly payments are counted as operating expense; for capital lease, you need to put your car as an asset, and generate a depreciation cost in your income statement (or tax return form); the interest part of your monthly payment belongs to operating cash outflow, and the principle portion of the payment is counted as an financing cash outflow. Of course, all of the above discussion only applies to people that run business themselves; if you do not own a business and just use your car to go to work daily, it is not easy to claim any benefits in your IRS tax return. But one nice thing for people in US who owns a business and leasing cars is: for operating lease, IRS allows you to claim depreciation expense on your leased car, as if you have purchased and owned it, and claim the interest payment as operating expense at the same time, which usually provides a much larger tax reduction benefit (this is because generally speaking you will get a certain percentage off the MSRP when leasing a car, but the depreciation value calculated under IRS standard is based on the full MSRP – which means you pay less but can claim more). Anyway, let’s take a look in the following statistics, which tells us that in 2013, how many people lease cars (regarding to different brands). Data courtesy of NADA and Experian Automotive. First is the mainstream brands. 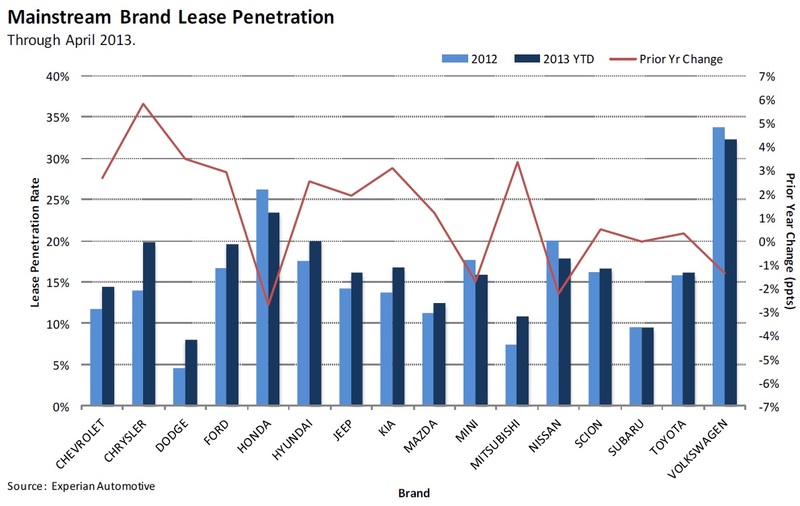 From the above chart we see Volkswagen has the highest lease percentage, which is closed to 35% for 2012 and around 33% for the first 4 months in 2013. There is a saying that the less reliable of a car, the more chance that people just lease it, not buying it. 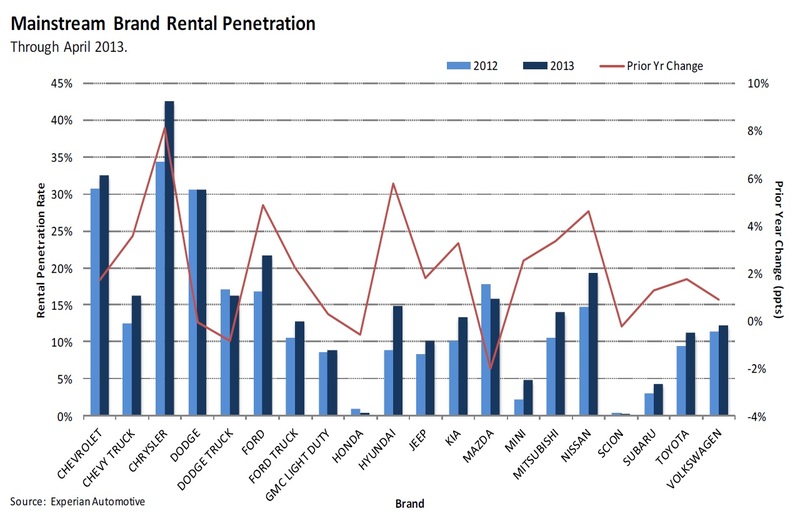 It does not seem to be the case, because some of brands whose product is less reliable statistically, actually has lower lease penetration rate than other brands. The following is the luxury brands. Infiniti, Jaguar and Mercedes-Benz get the highest lease penetration rate, more than half of the people that driving those cars are leasing. 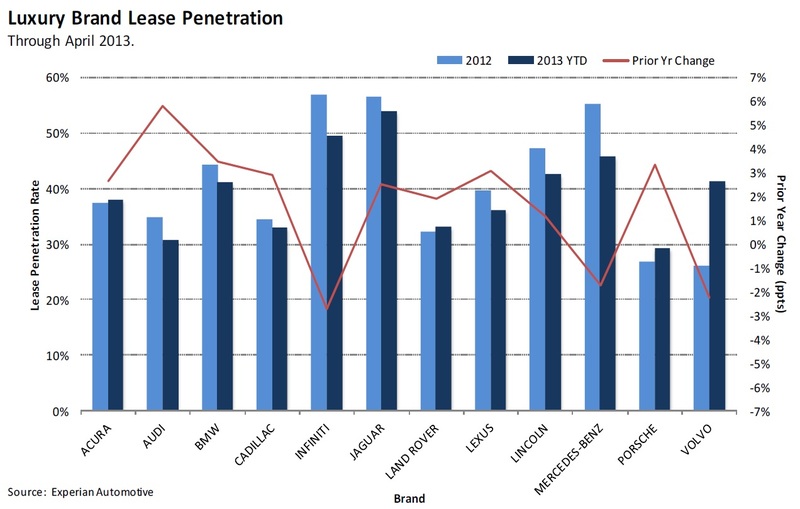 Compared to the first chart above, on average a luxury car buyer is more incline to lease instead of purchasing. There is a business that very closely related to car leasing, that is rental car companies. When a rental car company acquires a new car, it does not necessarily lease that car. But from the consumer aspect, a car registered as a rental car effectively indicates it is used similar to a short-term leasing purpose. If you are buying a luxury car, you may not want that car model is a high volume model in rental car companies, right? “Rental-car-grade” is absolutely not a compliment to one’s car. Below image tells you what is the percentage for each car brand, for the whole year’s sales, is sold to rental car companies. It is quite shocking to know that almost 43% of Chrysler brand cars, are sold to rental car companies, which means on average, out of 10 Chrysler cars you see on the street, 4 of them are rental cars. Chevrolet gets the next highest rental percentage rate, between 30% to 33%. There are also some brands that you will rarely find in the rental car companies’ inventory, for example Honda and Scion. Actually I have never get a change to rent a Honda or Scion too. For the full NADA report that contains more detail information, please download the PDF version here.